Cardinal Foley celebrating Mass at Sacred Heart Parish Dec. 16, 2007. Cardinal Foley blesses the congregants at the Mass at Sacred Heart Parish Dec. 16, 2007. During the blessing of the Cardinal John Foley Room in the Archdiocesan Pastoral Center. Cardinal John Foley with the staff of the Catholic Standard & Times in 2007. 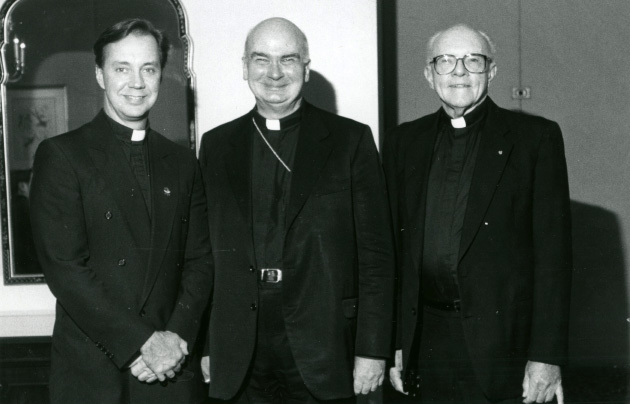 Bishop Daniel Thomas, Cardinal John Foley and CS&T General Manager Matthew Gambino at the Archdiocesan Pastoral Center, Dec. 13, 2007. Auxiliary Bisop Daniel Thomas shares a laugh with Cardinal John Foley Dec. 13, 2007. 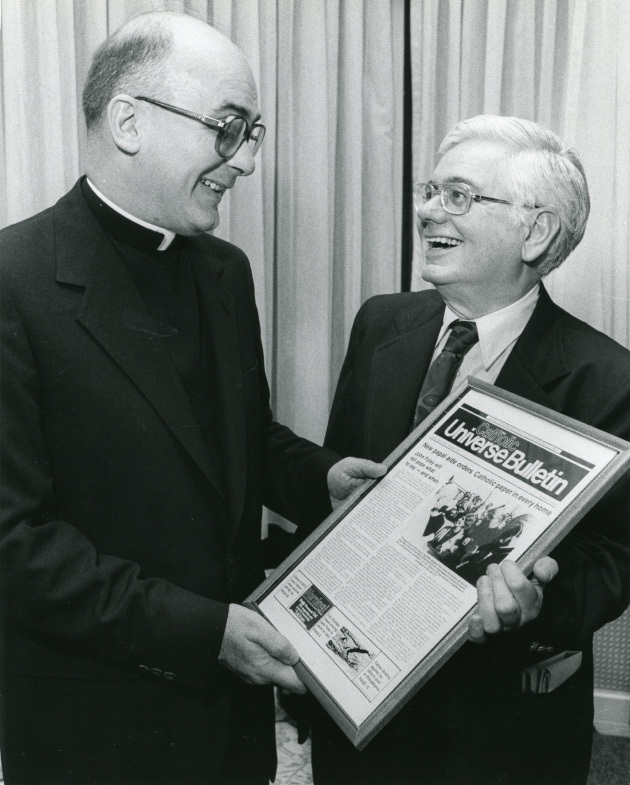 Cardinal Foley leafs through an issue of the Catholic Standard & Times after blessing the reading room named after him in the Archdiocesan Pastoral Center, Dec. 13 2007. Cardinal Foley blesses the reading room in the Archdiocesan Pastoral Center named after him, Dec. 13, 2007. Cardinal John Foley with Communications Director Donna Farrell at the Archdiocesan Pastoral Center. Dec. 13, 2007. Cardinal John Foley at Mass at the Cathedral Basilica of SS. Peter & Paul in Philadelphia, after his elevation to cardinal. Dec. 13, 2007. Cardinal John Foley greets people after Mass at the Cathedral Basilica of SS. Peter & Paul in Philadelphia, after his elevation to cardinal. Cardinal Foley blesses Joseph Novetsky, a longtime Catholic Standard & Times employee at the Dec. 13, 2007 Mass at the Cathedral Basilica of SS. Peter & Paul in Philadelphia, after his elevation to cardinal. Dec. 13, 2007. Cardinal John Foley celebrates Mass at the Cathedral Basilica of SS. 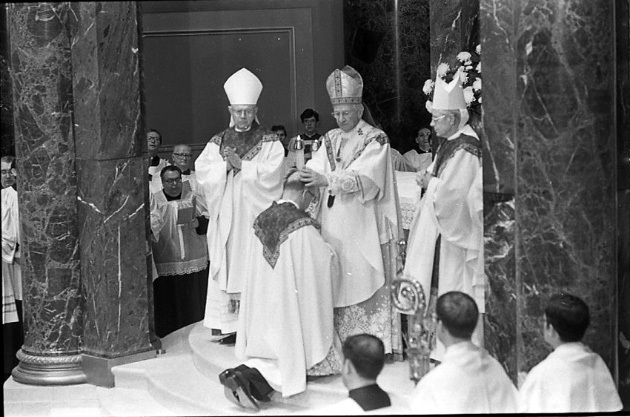 Peter & Paul in Philadelphia, after his elevation to cardinal. Dec. 13, 2007 Cardinal John Foley receives a city proclamation after having been elevated to cardinal. At St. Charles Borromeo Seminary Jan. 2001. Mass at St. Charles Borromeo Seminary Jan. 2008. At the Seminary after being named cardinal grand master of the Equestrian Order of the Holy Sepulchre. Cardinal John Foley at the Seminary after being named cardinal grand master of the Equestrian Order of the Holy Sepulchre. Cardinal Justin Rigali and Cardinal John Foley at the Seminary in January 2008. Cardinal Foley speaks with CS&T writer Lou Baldwin at the Seminary after being named cardinal grand master of the Equestrian Order of the Holy Sepulchre. Cardinal Foley, center, with lifelong friend Bob Sims, right. 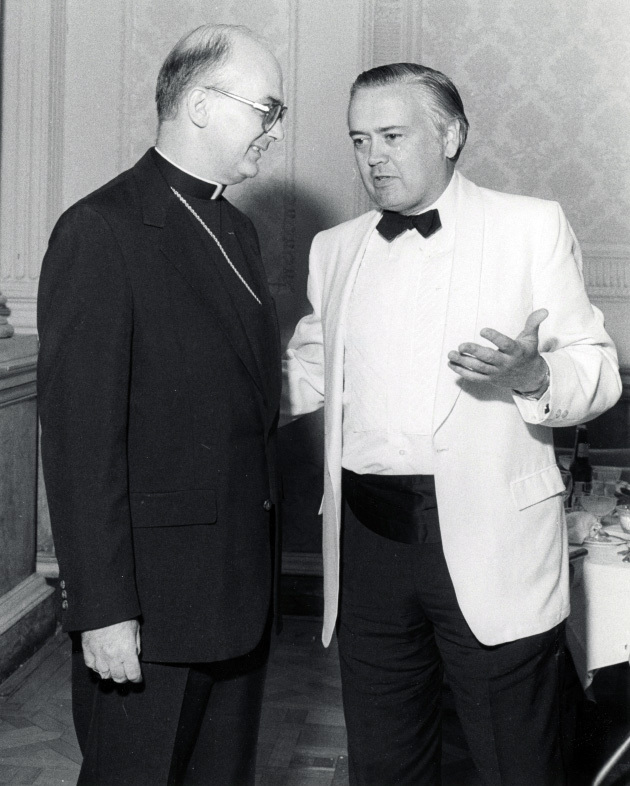 Cardinal Foley, left, with lawyer and friend George Ford. 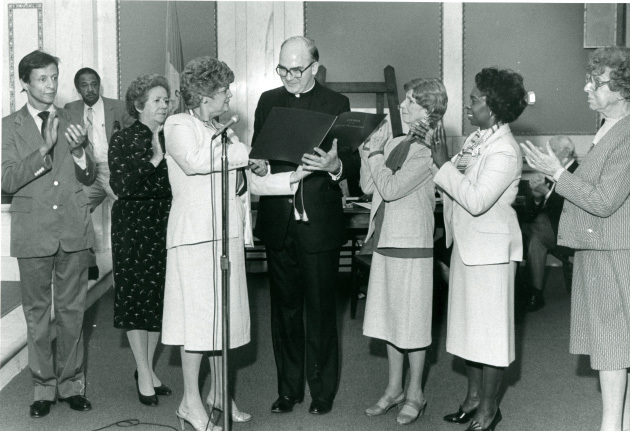 Councilwoman Joan Krajewski, second from left, hands a city proclamation to Cardinal Foley while his mother Regina, second from right, looks on. 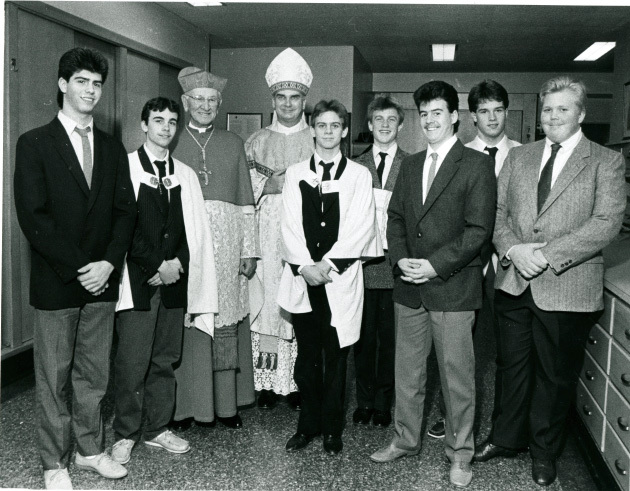 Cardinal John Krol, second from left, and then-Archbishop Foley, gather with young men before Mass. 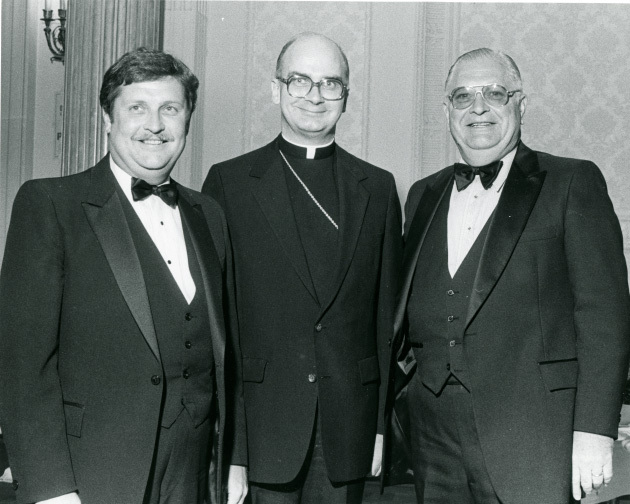 One, Jonathan Dalin, at right, who went on to become an archdiocesan priest. Cardinal Foley with the staff from the Catholic Standard & Times. 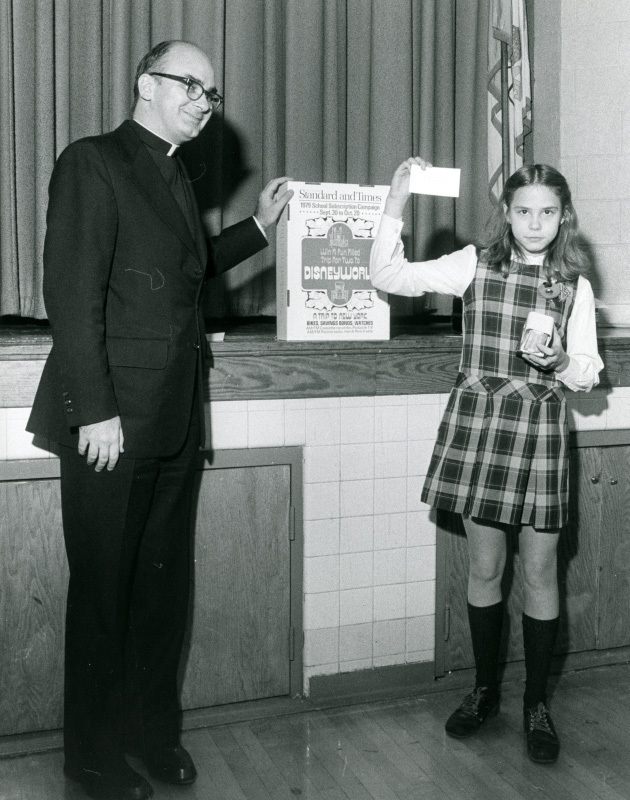 Cardinal Foley with a winner from one of the Catholic Standard & Times School Subscription drives. From left, Cardinal John Foley, Msgr. Francis Carbine and Father John Bonavitacola. Three former editors of the Catholic Standard and Times. From left, Father Paul Quinter, Cardinal John Foley and Msgr. Francis Keul. 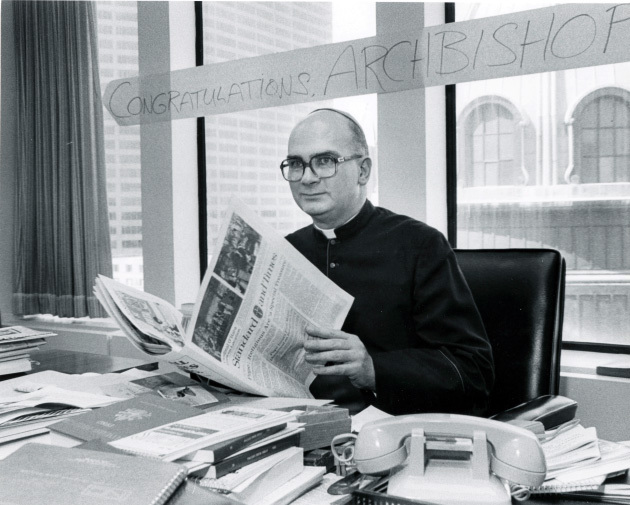 At the time of his episcopal ordination, Cardinal Foley sits at his desk at the Catholic Standard & Times. 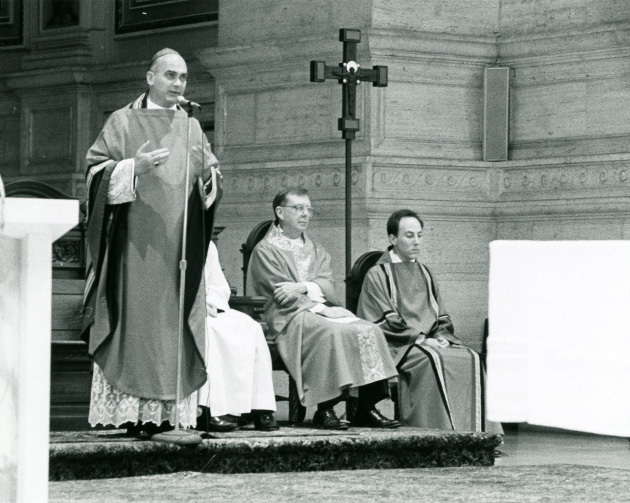 Cardinal John Krol, center, was the principal consecrator, and Auxiliary Bishop Martin Lohmuller, left, and Bishop Thomas J. Welsh, right, co-consecrators during Cardinal Foley’s 1984 episcopal ordination. 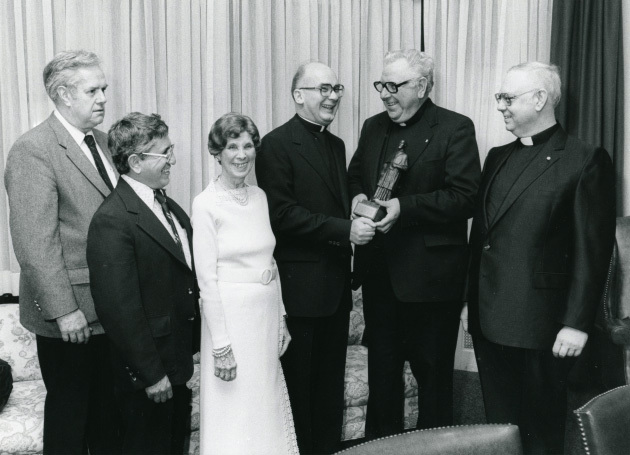 Catholic News Service columnist Moises Sandoval (second from left), Cardinal Foley’s mother Regina, Cardinal Foley, and friend and fellow newspaper editor Msgr. Owen Campion (far right). July 4, 1982: July 4th celebration at Independence Hall. Cardinal Foley delivers the Prayer of Thanksgiving for Democracy. 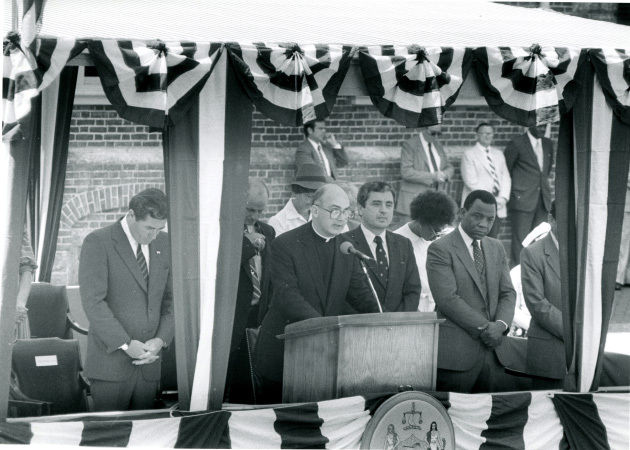 He’s flanked by Philadelphia Mayors Bill Green (far left) and Wilson Goode (far right). 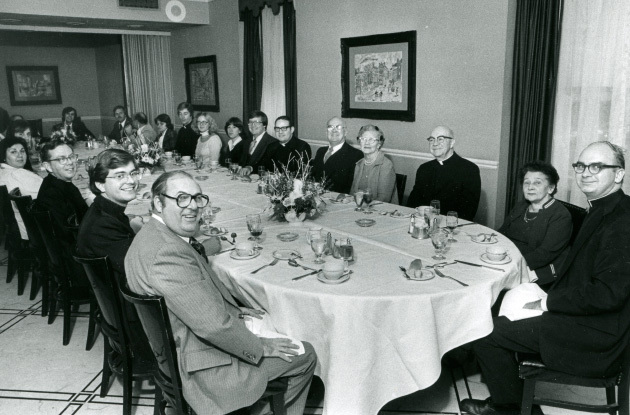 April 4, 1986: St. Jospeh University professors honored for “One Hundred Years of Service” at dinner at the Downtown Club. 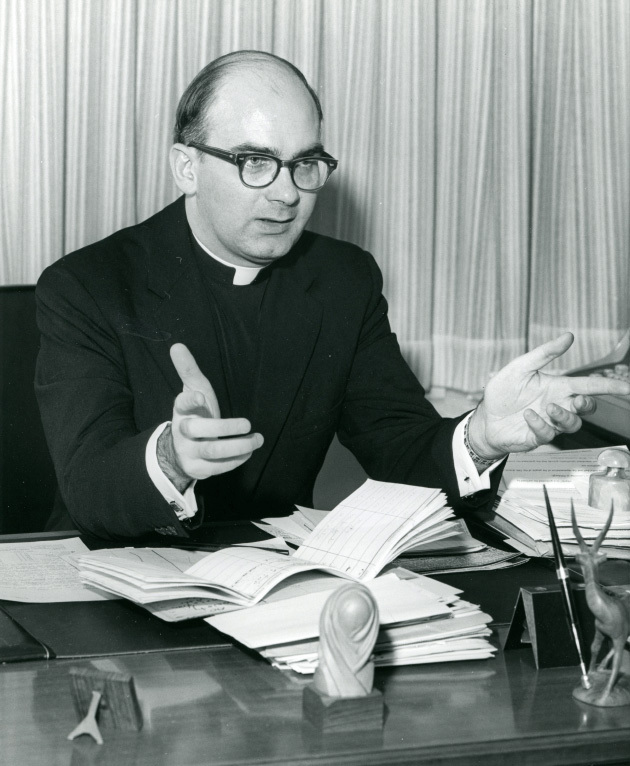 Archbishop Foley was the speaker. 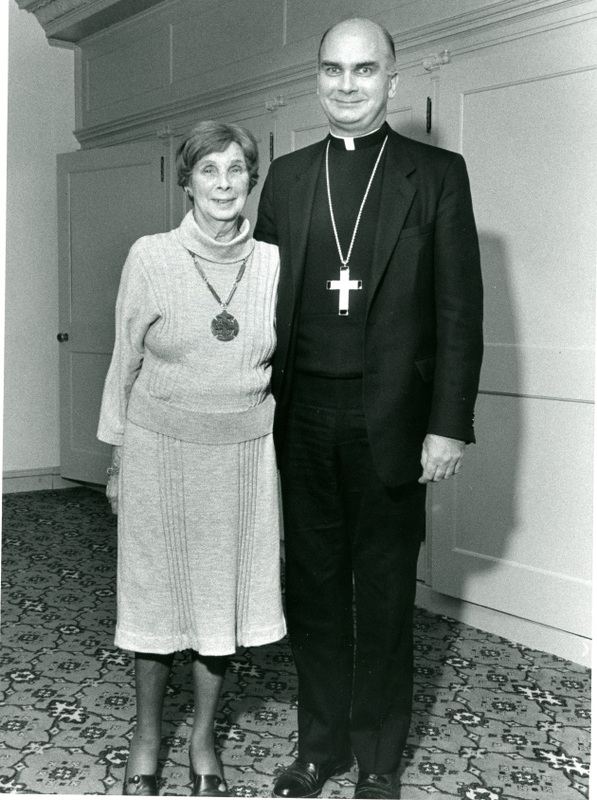 He’s pictured here with his mother, Regina. Teaching. Photo from 1972 issue of The Sower, yearbook of St. Charles Seminary. 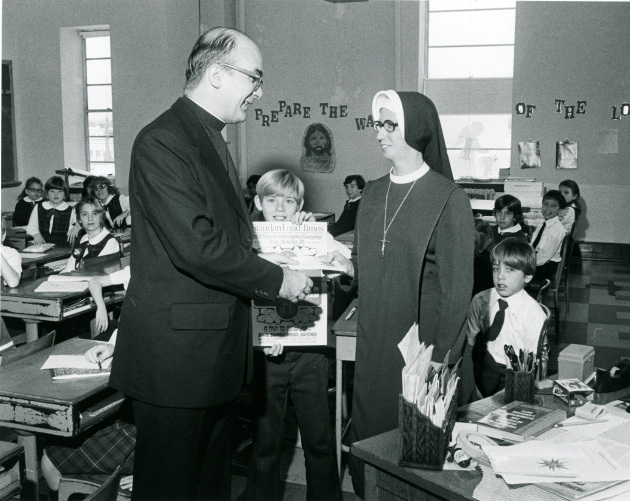 February 5, 1970: St. Charles Seminary Thursday Apostolate. Seminarians working at the CS&T. (John Foley, Joseph Quindlen and John Collins). Cardinal Foley receives another red “hat,” this one a St. Joe’s Prep alumni cap, and a personalized Prep jacket, during a Dec. 12 2007 visit to his alma mater. 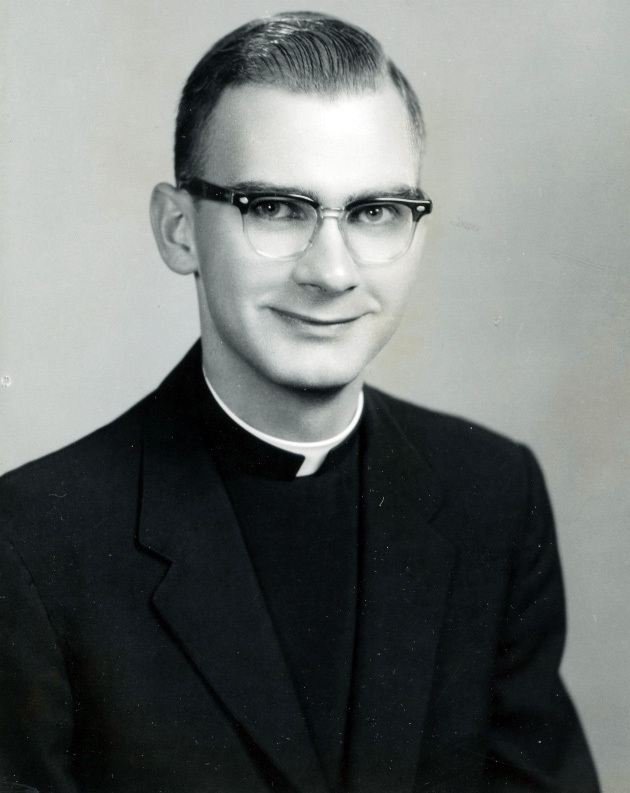 We have fond memories of Cardinal Foley’s caring and enduring friendship since he officiated at our marriage on June 16, 1962, at Sacred Heart Church, Manoa – just shy of one month after his ordination to the holy priesthood on May 19, 1962. In 2012, we would have celebrated our mutual Golden Jubilees. He has been an inspiration, and a comfort, to us over the years. We will miss our annual visits with him after Mass, which he celebrated every August on the Feast of the Assumption, at the Basilica of the National Shrine of the Immaculate Conception in Washington, DC. Be they ever so brief, they were a constant spiritual renewal for us. May he rest in a well-deserved Peace of Christ.